Contrary to popular belief, Microsoft is doing very well indeed. You've only got to look at the last financial results for that. Revenue of $24.52 billion in a single quarter. This is an immensely strong corporation. That strength has come from its previous two CEOs - one the founder, the other appointed from within. And it's why I believe Satya Nadella is the perfect fit to lead Microsoft into a new era where it fixes the issues it has experienced in the recent past. And, my, there have been issues. Nadella is inheriting a changing and challenged Microsoft. Just think of the problems with Xbox One: that kerfuffle over DRM and the lack of detail in graphics compared to PS4. And then think of Windows 8 and the fact that, 14 months after launch, the app ecosystem is still poor. And that's before we talk about Windows 8's suitability for tablet use. Or the fact 20% of PC operating systems worldwide are still the soon-to-be-defunct Windows XP. Oh, and the small matter of Windows RT, the OS that should die. Nadella is the guy to fix these problems. Despite numerous rumors and the Nokia acquisition, it doesn't seem Microsoft were keen to bring Stephen Elop back into the fold, and in the end the radical change proposed by Ford's CEO Alan Mulally just seemed a step too far. Instead, the board went for continuity in Nadella - a guy who has had recent success in furthering Microsoft's cloud interests as well as building the infrastructure to make it happen. As Bill Gates says: "Satya is a proven leader with hard-core engineering skills, business vision and the ability to bring people together." We also shouldn't be fooled by the return of Gates to a more regular role. It's surely just a show to investors that the original Microsoft's strengths are still there, but really Gates has always been a supreme influence over Microsoft even since his semi-retirement and has had more than enough to say during his one day a week when he's not flying around the world battling Polio and meeting world leaders. 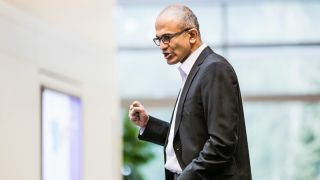 We're looking forward to hearing Nadella deliver the kind of keynote speeches we've heard from Gates and Ballmer in the past - hopefully at the Consumer Electronics Show (CES) and pushing through to a leaner, faster and more efficient Microsoft. I reckon he'll do just fine. And I've only got one piece of advice for him: Kill Windows RT and get tablets running Windows Phone instead. Like, yesterday.